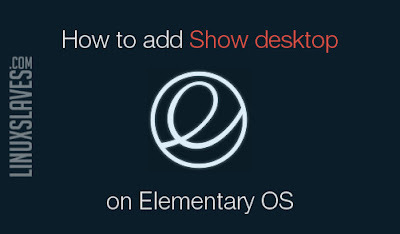 A simple ways to use show desktop feature in Elementary - A couple week ago, I tried to change Backbox that installed on my laptop with another Ubuntu based distribution. Until I decided to try Elementary OS. The first impression after installed this distro is Amazing! Really clean UI, smooth make me excited to work longer with this distro. Elementary OS is an Open Source operating system, Linux distribution based on Ubuntu. A great choice for a fast and open replacement for Windows and OS X.
EOS was founded in 2007 by a small group of passionate volunteers. Over the years, they been able to grow into a tiny company and fund the development of open source software. They’re a dedicated team of developers, designers, writers, and everyday computer users crafting an incredible open computing experience. You might like to read Best and Popular OS For Hacking and Penetration Testing 2016. Some of its more interesting features include a custom desktop environment called Pantheon and many custom apps including Photos, Music, Videos, Calendar, Terminal, Files, and more. It also comes with some familiar apps like the Midori web browser and Geary mail. But, the developers brings Pantheon as default desktop environment originally created for the elementary OS. It is written from scratch using Vala and the GTK3 toolkit. With regards to usability and appearance, the desktop has some similarities with GNOME Shell and Mac OS X. I think Patheon is the better if we compare with Unity. More smooth, cooler, more clean, and faster. So I made a video that hope give you a reference. Short description : running on Lenovo G40 laptop with 2GB RAM. But I have to look something feature. It's about add show desktop to the Elementary panel. 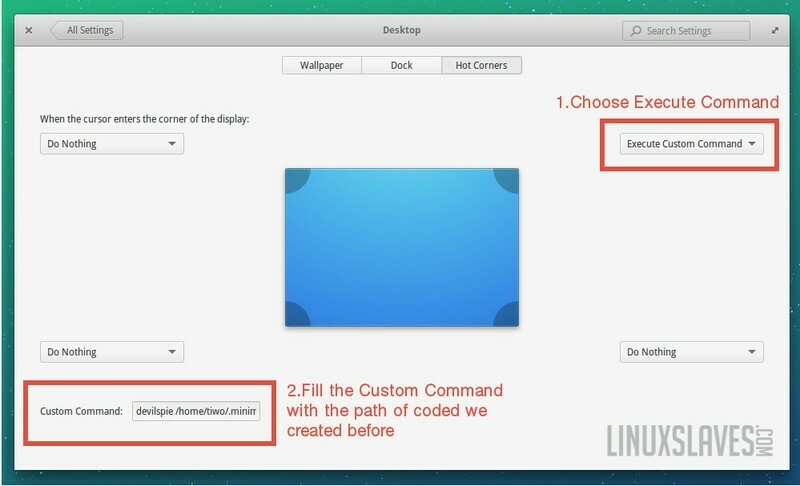 Cause this is my habit to add this feature to all the Linux distro I've ever installed. After I explore the Elementary setting and preferences, I still can't see where is this feature embedded. Finally, I make a decision to add show desktop using hot corners feature that available in many Linux distribution. Step 1 - Open your Elementary terminal. Step 3 - Just wait until the package installed properly to your system. Step 4 - Once installed, create a script with your favorite text editor. Also on Linuxslaves 5 Best Programming Text Editor For Linux Distributution. Step 6 - Save with minimize.ds (give a (.) to make it hidden from the file manager). Step 7 - Now go to System Setting -> Desktop -> Hot Corners. Step 8 - Choose one corner you want to use. For example, I want to make top right corner to minimize all application. So read next steps! 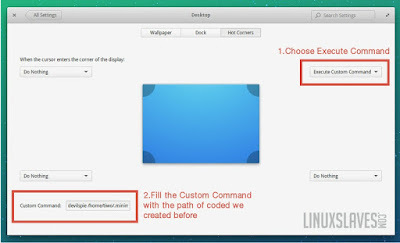 Step 9 - Change "Do Nothing" to "Execute Custom Command". Then fill "Custom Command" with the path where you save or put the script we created before. Example : devilspie /home/tiwo/.minimize.ds ( Replace tiwo with your username ). That's all I can write about a guide to use show desktop and minimize all application in elementary OS. Hope you've enjoyed reading this tutorial as much I’ve enjoyed writing it and thanks for visiting us.